The panelists from yesterday’s community forum (from L to R): Jill Bartolotta, Jared Bartley, Michael Summers and Jason Wood. 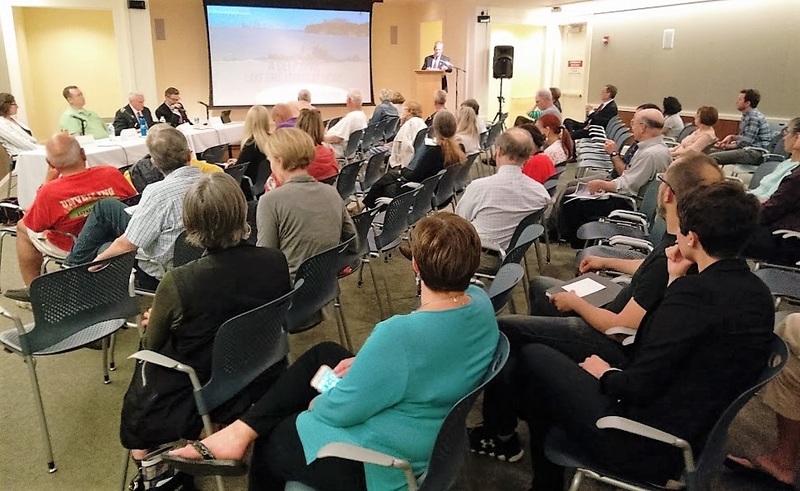 The forum, which was open to the general public, explored the monumental role Lake Erie plays in our lives, the issues facing our Great Lake and how we as citizens impact its water quality and overall health. Moderator Terry L. Robison, Ph.D. – Director of Natural Resources for the Cleveland Metroparks – oversaw a distinguished group of panelists for a wide-ranging discussion, and audience members were given the opportunity to submit questions on notecards. 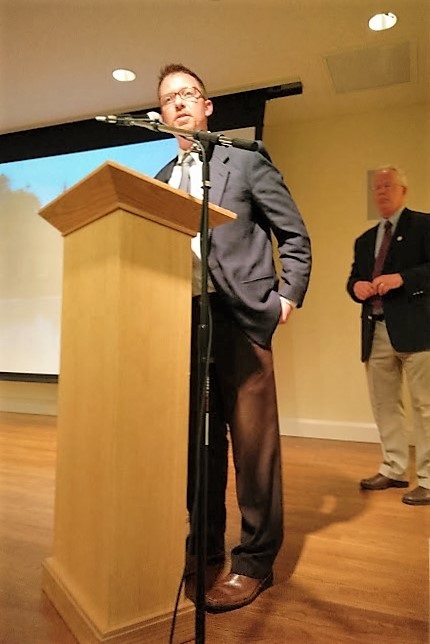 Ian Andrews, Executive Director of LakewoodAlive, provided opening remarks for the community forum, which was attended by city leaders, environmental advocates, residents and elected officials. LakewoodAlive selected the forum’s topic by conducting an informal poll among its various constituent groups. 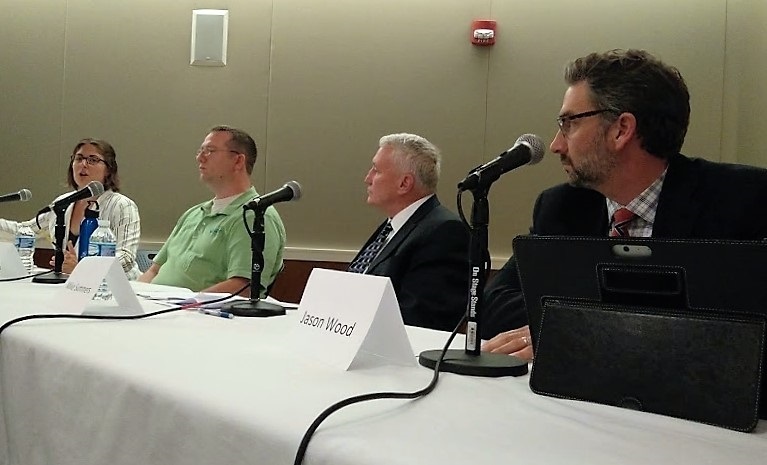 The panel consisted of Michael Summers, Mayor of Lakewood; Jared Bartley, Rocky River Watershed Coordinator, Cuyahoga Soil & Water Conservation District; Jill Bartolotta, Extension Educator, Ohio Sea Grant College Program; and Jason Wood, Chief of Public Affairs, Cleveland Public Utilities. After introducing the panelists, Robison provided a series of facts regarding water scarcity and Lake Erie, our region’s most crucial natural asset. Although 70 percent of the Earth’s surface is covered by water, less than 1 percent is available for drinking and other human purposes, with the Great Lakes watershed containing 18 percent of our planet’s fresh water supply. From L to R: Ian Andrews, Executive Director of LakewoodAlive, and Terry L. Robison, Ph.D., Director of Natural Resources for the Cleveland Metroparks. The panelists cited climate change and aging infrastructure among the greatest threats to Lake Erie’s longterm health, yet the group also empowered the audience with ways community members can support the world’s 11th-largest fresh body of water. These suggestions ranged from utilizing rain barrels and green roofs to manage stormwater runoff to participating in river cleanup projects to protecting our remaining wetlands. Bartley credited Lakewood for serving as a countywide model for effective stormwater management with the city’s recent developments, such as the new north entrance bioswale at Madison Park, which includes vegetation designed to prevent water runoff. Bartolotta conveyed the economic importance of Lake Erie, referencing that it provides drinking water for 13 million people and represents a $40 billon tourism industry for Ohio. Despite accounting for only 2 percent of the Great Lakes’ water, Lake Erie serves as home to half of the Great Lakes’ fish population. Wood described the region’s water system as being capable of supplying five million gallons of drinking water each day and containing enough pipes to stretch from Cleveland to Athens, Greece. He indicated the system is well-prepared to thwart algae and other toxins Lake Erie might encounter. Nearly 60 city leaders, environmental advocates, residents and elected officials attended the community forum on June 14.